By Scott Gilfoid: Andre Dirrell (20-1, 14 KO’s) plans on getting back in the ring by April of this year against a still to be determined opponent, according to fighthype.com. Dirrell wants a fight against IBF super middleweight champion Lucian Bute (29-0, 24 KO’s) and would take him on immediately if Bute would give him the fight. Dirrell is going to have to likely wait a while for the Bute fight because he’s trying to put together a two-fight deal with Carl Froch and that could take up a substantial amount of time for those two fights to get completed. At best, Dirrell might get a crack at Bute by November or December depending on how things go in Bute’s two fights with Froch. Dirrell looked outstanding in beating Darryl Cunningham by a 2n round TKO last month on December 30th. 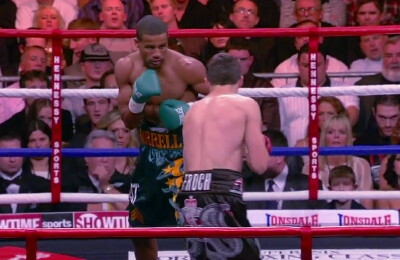 The hand speed, the movement and the defense were all still intact for Dirrell. But what was really surprising was the power that Dirrell revealed in blasting the tough-chinned Cunningham out with a two-knockdown performance. Dirrell looked really powerful and was hitting Cunningham with massive shots that would do his brother Anthony Dirrell proud. Anthony has always been the slugger in the family, but Andre showed that he can be just as much of a knockout threat as his brother. What Andre needs is a couple of good wins to get himself back in the super middleweight rankings and then he can target the winner of the Froch-Bute fights. Andre Ward has already given Bute his marching orders that he has to beat at least two A level fighters before he’ll give him a shot at his titles. If Bute beats Froch in two fights, he’ll still need one more A level opponent before Ward will pay attention to him. That’s where Dirrell comes in. Bute will have to step up to the plate and take on a fighter with hand speed, better defense and footwork than himself. I think Bute may try to get out of that fight and continue with his easy fights against soft opposition rather than face Dirrell and risk getting beaten.